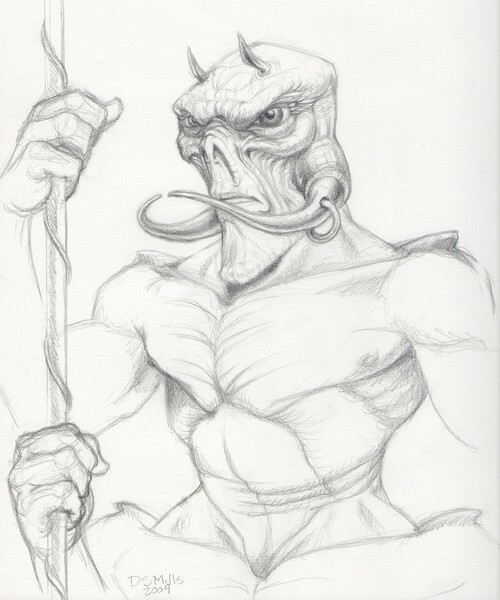 This creature is from the Edgar Rice Burroughs novel A Princess of Mars. Okay, it's only a sketch of the top third of the alien but it's a start! I intend to paint this guy one of these days. Artist Reply: Thanks for commenting, Renata. Yes do paint him. I bet he's more scarey in pencil or ink than in color!! Imagination is a powerful thing!! This "sketch" is wonderful.. He is a scary fellow Dan.I'm sure i woulkd not want to meet him in a dark alley......your sketch is good.